Today I headed out early to help my nephew Haven (the plumber) move into their new house. The place where he and his wife have lived for the last 10 years or so is was nice place, but it's further in the sticks than where Jilda and I live. I'm not sure they took American money there. He got an opportunity to buy a beautiful place nestled in a quiet community with huge lots. The house has more windows than our house, and I wasn't sure that was possible. He does a lot of commercial work for chains with deep pockets, and that's his bread and butter, but he also does residential work as well. He has a soft heart for widows and people going through hard times and winds up doing a lot of work at or below cost. The upside of that is a LOT of people owe him favors. When he put out the word that he needed help moving, a swarm of big burly guys showed up to help him "Git-R-Done." I worked the Uhaul moving things to the back of the truck, and a never-ending train of muscle was waiting to whisk it inside. I've never seen so much stuff get moved and set up so quickly. Tomorrow is decoration day where Jilda's parents and grandparents are buried, so she worked on floral arrangements while I helped Haven move. When the sun got low in the west, we headed down to the cemetery to place the flowers on the graves. Going to the cemetery is often like a reunion. We see people we haven't seen in years. Today was no different. 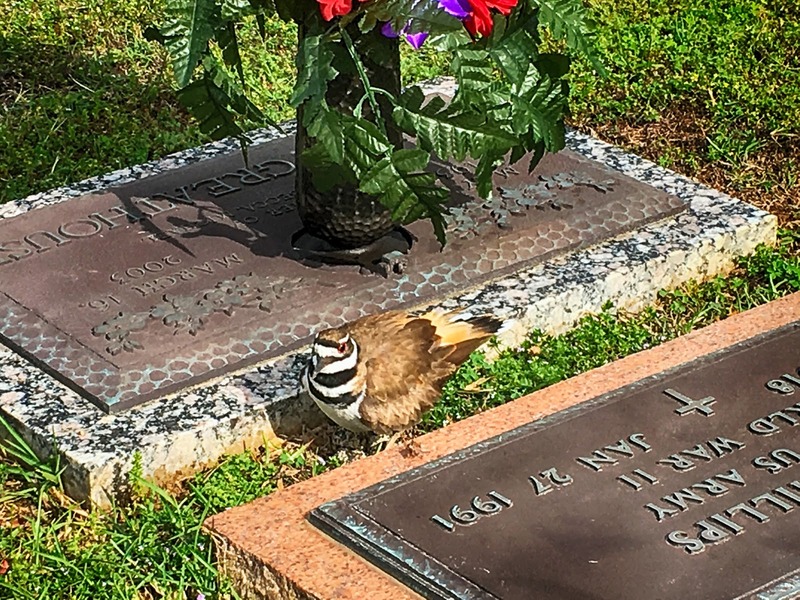 When Jilda first walked up to the gravesite, she heard a bird in distress. She walked over to investigate, and the bird fluffed out and chirped in a pleading tone. She seemed to be saying, "PLEASE stay away from here." Jilda waved me over to show me the bird. Upon closer investigation, I could see the bird was guarding her nest. Four tiny eggs were between the footstone of Jilda's father and the headstone of our brother-in-law. I snapped a picture and slowly backed away. Jilda alerted her sister and other relatives as well as the people who maintain the cemetery. 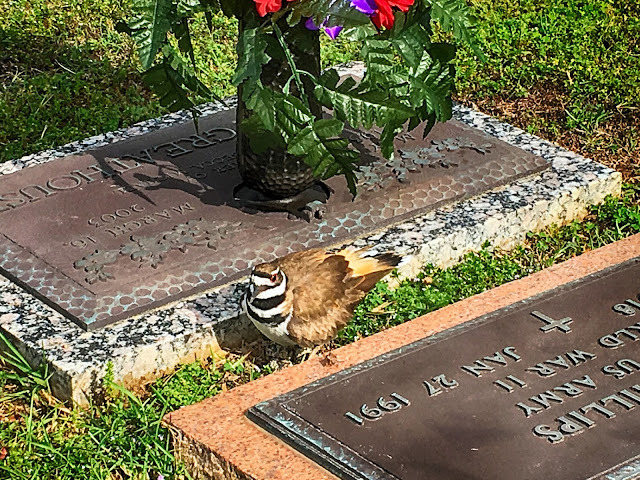 We're hoping that people visiting the cemetery tomorrow are kind to our new feathered friend. NOTE: when I looked the bird up online, it's a Killdeer. Kindness pays off, as mama would say :do unto others as you would have them do unto you! Love this short story (That was long in the making). Also love a bird who would protect her territory! Pretty bird, new to me, can you identify? Lovely story and yes, I hope they are kind to her too. Bird minding her nest of new lives in a place of minimal disturbance --an irony there. Your compassion was doubtless appreciated. A moving Mothers' Day tableau, thanks. I'm saving my decoration day at the cemetery for Memorial Day weekend. Your picture reminds me...that we are all in the good Lords care. Rick, I had a similar experience the first time my daughter and I went to visit my mother's grave. As we approached the grave, we saw a killdeer running across. When we arrived, like you, we saw a next right on my mother's grave. What made this even more meaningful was that when my mother died, I was not there, but her sitter later told me. "It was midnight when they came to take her body to the morgue and you will not believe this, but when they opened the front door to carry her body out, the birds were singing even though it was in the middle of the night." I've never seen a killdeer bird so I had to look it up on Google. They can lay their eggs right in gravel. I hope that they come to no harm. Kindness begets kindness. It is proven over and over again. Happy Mother's Day to all mothers (including the mama bird)!! Alongside, one life ends; another begins. This image is powerful indeed. Dear Rick, this is a heartwarming story. I've read it today--Mother's Day--and I'm hoping that Ms. Killdeer had a good mother's day also. Peace.